About our special election show last night, I think it was pretty much as advertised. Three pretty competitive Congressional races in a state where you’re lucky to get one among our 13 seats in any given election year. Gov. Christie, he of the rising GOP star on the national stage, is off on another national whirlwind campaign tour this last weekend before the all-important mid-term elections with a number of other major players in the Republican party who are looked upon as contenders in the 2012 presidential race. There are three tight Congressional races here in Jersey where the Republicans have a good chance of knocking off the Democratic incumbents (see previous post). So I’m wondering why the governor — with approval ratings here in Jersey of over 50 percent — isn’t hitting the stump for the home-grown candidates in his own state. I haven’t seen much about this out there in the press. I’ll pop the question to Montclair University political scientist Brigid Harrison tonight on NJN News in our Inside Politics segment. I’m looking forward to hearing her take on it. You can listen along with me on NJN2 at 5:30 or at 6, 7:30 or 11 p.m. NJN. Of course, it’ll also be archived for a week on njn.net. Oh, and one more thing, State House Correspondent Zachary Fink and Photographer Bob Hartman were out early this morning to cover the action with Gov. Christie at an airport in Reading, Pa. So you can catch that story tonight, too. Another I’m looking forward to watching. See ya on the tube. No one, to my knowledge, has given next Tuesday’s general election any kind of nickname or nom de guerre, if you will, but to paraphrase the late Ed Sullivan, it’s going to be a really big show. Our live election night coverage beginning at 8 on NJN as well as on our website (njn.net) and NJN radio should be fun, lively and engaging. So be sure to tune in if you have any interest at all in state, national and even local politics as this one plays out. Pundits to the left, right and center are all predicting a landslide victory for the Republicans to the point where flipping Democratic control of the House of Representatives is virtually guaranteed and a 10-seat swing for control of the Senate — unthinkable a few months back — is considered at least an outside shot. 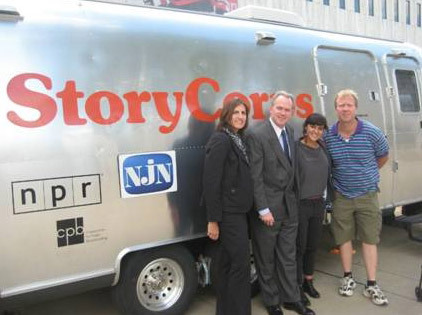 After my last post on StoryCorps, I wanted to give credit where credit’s due in terms of who from NJN was responsible for getting the group here; add a couple of photos of the gang out at the StoryCorps site in Trenton and provide a link to NJN’s site specially set up for the program where you can find some Jersey folks who’ve offered their stories (and from which you can also get to the organization’s main site). First off, it was Susan Wallner, a producer/director who works on State of the Arts and other fine NJN programming, who arranged for StoryCorps to come and for NJN to share its name and co-sponsorship with such a fine organization. She didn’t brag about it; in fact I had to ask her to get it out of her. She said she got the wheels rolling about a year ago. The project was all booked up at the time, but was kind enough to pen Trenton into the calendar for the past month or so that they’ve been here. At bottom are a couple more photos. 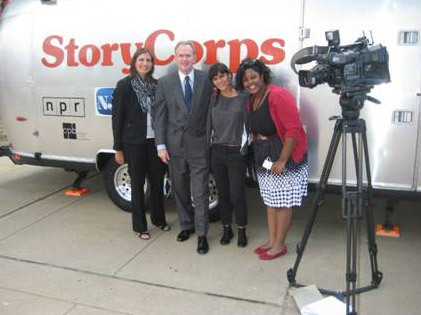 You’ll see Susan, myself, Lilly Sullivan of StoryCorps and Sia Nyorkor of NJN News and Radio in the first shot. And Susan, myself, Lilly and NJN News Cameraman (and resident history buff) Tim Stollery in the second shot. Lilly’s co-workers on the road are Virginia Lora, raised in Peru before moving to Miami when she was 11; and Marquita James, Louisiana-bred. Oh, and one last thing from a parting conversation Lilly and I had last night. She says the time has flown by; she doesn’t know where it’s gone and she’s gonna miss this place. We’ll miss you and yours, too, Lilly. Thanks for stopping in and brightening things up around here for awhile. Oh, and you’re welcome back around these parts anytime.